- That fourth and three play that didn't work for Wolverines near the end of the third quarter summed Michigan football as it stands these days. 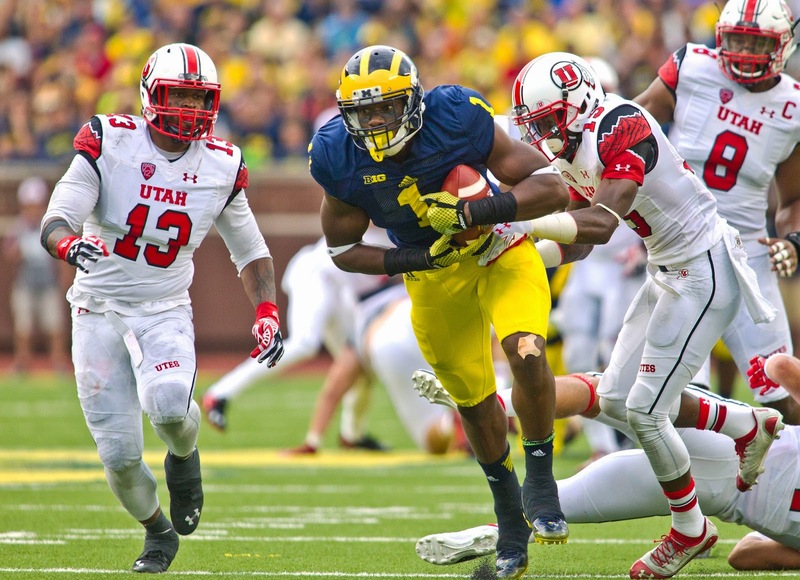 Devin Gardner, running aimlessly and without and blocking and getting crush. This game is danger of turning ugly. - Michigan's only hope may have been that Utah starting QB Travis Wilson didn't return to this game, but he did. It was also just a matter of time until wide receiver Dres Anderson, who may be a first-team All-Pac 12 selection, made a play. He is remindful of Oregon State's Brandin Cooks, who is playing so well for New Orleans in the NFL as a rookie, after being taken in the first round of last spring's draft. You can't give a player like Anderson the ball in space like that. His catch-and-run quickly turned the course of this game. - Anderson was a three-star recruit. Wilson was a three-star recruit. Utah does recruit well, especially in California, but not to the same level as Michigan. That's why it is puzzling they look much more athletic than the Wolverines. That's especially true of the skill personnel on the offensive side of the ball. - Michigan's defensive line is playing a pretty well for the most part. The offensive line, typically, hasn't been so good.